We had always longed to explore Southeast Asia and knew that a cruise on the mighty Mekong would take us deep into the heart of the country. Already experienced travellers, my husband and I had just spent three days touring the stunning sprawl of ancient Angkor Wat and were longing for the calm of the river. We couldn’t wait to set sail. Onboard at last, we relaxed in deck chairs with cool drinks in our hands and were mesmerized by the sunset over the Mekong River as we began our seven-day Avalon cruise from Phnom Penh to Ho Chi Minh City. Transformed to a burnished gold, the river glowed, its glassy surface rippled by passing watercraft. The modern Avalon Siem Reap is designed with a shallow draft ideal for Mekong cruising. As we watched the world sail past we felt immensely spoiled. Our stateroom offered not only a spacious interior with stunning river views but also luxuriously soft white linens, an ultra-comfy bed, air-conditioning, a cleverly designed, elegant bathroom and cushy robes and slippers. Attentive service and exquisitely prepared cuisine were the highlights of every day. All drinks – from delectable fresh juice to local beers and spirits, frosty bottled water and hot coffee and tea were complimentary, as were the fine wines served at dinner. Only imported alcohol was extra. Old-fashioned pampering lulled us to the point where we could barely remember what hustle and bustle was. Our week was filled with excursions to craft-making villages, hillside pagodas, bustling market towns and fabled cities such as Phnom Penh and Ho Chi Minh City (Saigon). Though we sampled almost every tour, a few other guests chose to stay aboard to enjoy the passing scene from the comfort of the deck or from their own suites: brightly painted houseboats, fishermen casting their nets, farmers bathing their cows at the river’s edge, and the cheerful waves from passing river folk. This world of rice paddies, virgin jungle, market towns and farming villages fascinated us all. By the time we reached Ho Chi Minh City, we’d truly experienced life on the river – and it was a far more traditional life than we’d expected. We wandered through villages of stilted houses, travelled by sampan and ox cart, traded smiles with a farmer resting in a hammock with his Brahman cow nearby, saw women clad in their finest sarongs walking to a village wedding. We even brought supplies to an outdoor school where students learned English after regular classes and sang “Wheels on the Bus” with us. Communication in English at the school was a challenge, so as an icebreaker I offered one of my new 10-year-old friends a chance to try out my camera. He loved it. When, following my directions, he pushed a button to erase an image, we both grinned. “Delete,” he said, in perfect English. We wished we could as easily press “delete” on the region’s war torn past but no one seemed the least bit resentful of our western presence. On the contrary, the Mekong’s overwhelmingly youthful population joined their grandparents in welcoming us at every stop. The sights in the region were fascinating – from Cambodia’s Royal Palace with its ancient art to Phnom Penh’s five-star Le Royal Hotel with its photos of a radiant 1960s era Jackie Kennedy charming her hosts in fluent French. Even her lipstick-stained wine glass is proudly displayed, a precious relic. For diehard romantics, there was the Foreign Correspondents’ Club (FCC), now a hip Phnom Penh bar and restaurant. Back in the day, rifle-toting journalists famously filed their stories from the FCC, while knocking back glasses of Mekong whisky. 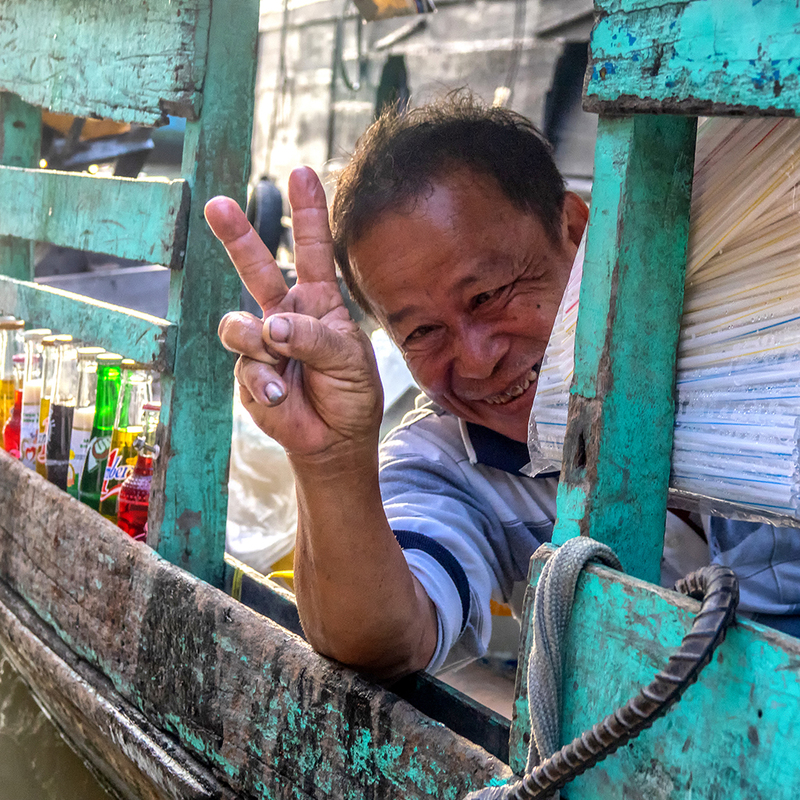 There’s history galore, but what truly captured us were the endless smiles and easy friendliness of the Southeast Asian people. Our river memories will endure: the hilltop town with its fine Buddhist compound, saffron-clad monks praying with visitors, statuary of every type (including giant plaster fruits) and a monkey and his owner resting in the shade of a cashew tree. These experiences, offered every day and included in the price of our cruise, filled fascinating afternoons. Back on board each evening, we savoured exquisite meals with choices that ranged from Asian to European cuisines all prepared by skillful chefs. At anchor in Phnom Penh, we were treated to a performance by youthful students of classical Cambodian dance, once considered a lost art, but now revived by a group that dazzled us with their heartfelt talent. We ended our river voyage in trendy Ho Chi Minh City, where the timeless Mekong yielded to modern world of motorcycles, American chain stores and Vietnamese silk boutiques. Here too, the mood was celebratory with wedding couples posing by the colonial-era Post Office and traditional musicians entertaining in cafés. We joined our fellow cruise guests in taking a complimentary Vietnamese cooking class and were awarded an impressive certificate for our efforts. The sites we visited and the adventures we had were unforgettable, but when people ask about our trip, it’s the velvet calm of a Mekong sunset that springs to mind, the quiet of a rural village, the sweet enticement of tropical fruits, the richly aromatic coffee and, perhaps most special of all, a child’s smile in an outdoor schoolroom. Written by Nancy Wigston for Globus Canada magazine (Spring 2019). Main photo courtesy of Avalon Waterways. Click here to view the entire magazine. 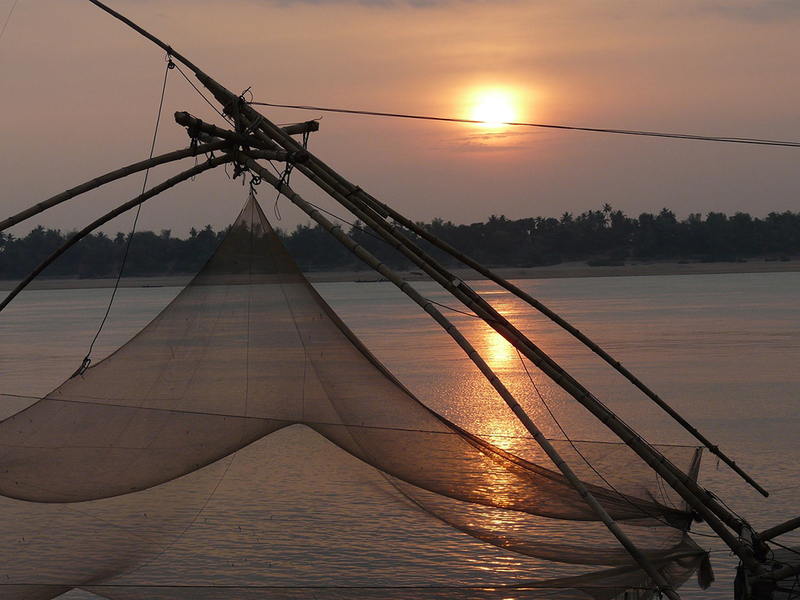 Want to experience the Mekong River for yourself? Right now Avalon Waterways is offering savings of up to $3,500 per couple on select 2019 and 2020 Mekong and Ganges sailings. PLUS, when you book by April 30, 2019, you can save an additional $200 per couple (mention promo code GFOB100 at time of booking). Talk to your travel agent or visit globusjourneys.ca for more information.